Onan island inside the Arctic Circle last Sunday (Dec. 12), the frigiddarknessof the early morning hours was broken by an intense orange glow, as aNASArocket blasted off for a brief flight arcing through Earth's aurora, ornorthernlights. Theseshimmeringatmospheric phenomena, produced when charged particles fromthe solar wind aresucked in by Earth's magnetic field, seem to create drag on satellites,andscientists are trying to figure out why. The65-foot (19.8 meter)-long rocket launched from Norway's And?ya RocketRange, packedwith instruments to take data on neutral gas, electric and magneticfields,precipitating particles, and other conditions inside the aurora. 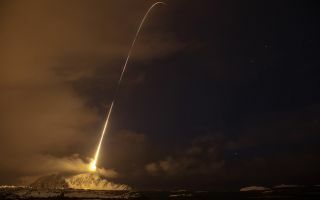 Duringits 10-minute flight, the rocket sent reams of data back to Earthbeforehurtling into the Norwegian Sea about 900 miles (1,450 kilometers)south of itslaunch point. TheRocket Experiment for Neutral Upwelling, or RENU, is aimed at measuringthecomplex, underlying physics behind satellite drag, which seems to beparticularly noticeable during periods of more fantasticalauroral displays. MarcLessard, associate professor at the University of New Hampshire andlead RENU investigator,said the study is taking a new scientific approach in its attempt totest,measure and quantify "electron precipitation" ? thephenomenon thatproduces the other-worldly light shows of the planet's auroras. "Thisis the first time anyone has tried to measure these neutral particleenhancements at these altitudes and with this combination ofinstruments,"Lessard said. Althoughthe effect of satellite drag can negatively impact a spacecraft's orbitovertime ? a concern for certain low-orbit, strategic satellites ? Lessardstressedthis was not the primary motivation for the experiment. "FromNASA's point of view this is a mission of pure science," Lessard said. "We're trying to understand the processes behind neutral upwelling andhowit is associated with visible auroraphenomena." AlthoughSunday's launch was an eventful one ? with several holds at T-10minutes andT-2 minutes ? Lessard says the experiment appears to have been asuccess. But becauseso much data was gathered, it could take months to analyze the results.